The Cat Clicks: Enjoy a Snowy Holiday at Genting's Snow World! 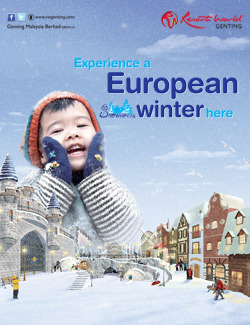 Enjoy a Snowy Holiday at Genting's Snow World! Last August, hubby and I went to Europe. It was the peak of summer. I also wish to travel to Europe again during winter. I prefer to go Switzerland next time. I read that Christmas markets in Germany and Austria is in the top list during the holiday season. That will be exciting, too! We all know how far and expensive it is to go all the way to our dream winter destination. We don't need to break the bank. We can enjoy a snowy holiday at Genting’s Snow World. The new SnowWorld is a whole new enchanted attraction that houses fantasies and wonders on a fairyland high at the peak! Experience the new attractions as you walk into our new SnowWorld in First World Plaza. Featuring a winter downtown and World Heritage concept, the breathtaking view of the entire surrounding will be a great place for photo shooting. Snow World, Genting’s own Winter Wonderland!